I have tried to write this review no fewer than four times. Each time I get about three paragraphs into it, and hit the delete key. Not because this book is terrible, but because I honestly can’t figure out how to talk about it. The Incrementalists is so deliciously complex and layered that talking about it in any generic terms requires some mental gymnastics. At a glance, The Incrementalists is a story about a secret society of do-gooders who reincarnate each life and take their memories and experiences into the new host, so as to continue their work. That, in and of itself, is unique enough to catch a lot of attention. However, The Incrementalists is incredibly deep and layered, playing with themes of reality, free will, and consciousness. It won’t take the reader long to realize that this isn’t a book you can just sit back and enjoy. It requires thought and understanding to fully grasp the plot and themes Brust and White are playing with. The way the authors handle the narrative might be one point of success or failure depending on the reader’s taste. The Incrementalists is told in first person. Specifically, two different people tell the story in first person. There is Phil, who has been around a long time, and Ren, who is being converted into the group by Phil for various reasons of his own. Usually multiple first person perspectives kill a book for me, but Brust and White manage it well. The Incrementalists is dialogue heavy, and occasionally these two characters would be talking to each other, and it could get confusing to remember who exactly was relating the conversation to the reader. Some of this book is confusing. There are a lot of conversational infodumps (which I found interesting depite their infodump nature), and because the topics are so in depth, there’s a lot of jargon thrown in that readers may or may not understand. Much of this, readers have to take on faith that they will understand what it at a later point in the book. Whether readers will understand everything perfectly or not is up in the air. After reading it, I feel like I understand most of what was happening and most of what the authors were alluding to, but I’m not completely sure. If that kind of thing bothers you, be warned. The Incrementalists is slippery in that respect. It’s one of those books that might need to be read a few times to understand it all. Phil and Ren are both perfect characters to narrate this story. Much like the book, they reveal their depth and layers as the story progresses. Each of them has a unique voice and their vast difference of experience gives readers a point to compare and contrast the happenings around them. Phil has been around a very long time, and Ren is a “convert” of sorts with no experience, who is learning as she goes. Ren’s newness and inexperience shows readers many of the flaws regarding the organization and subtly shows us how people can become numb and blinded to events happening around them despite their age and experience. Both of them, as well as those secondary characters along for the ride, have to learn about what is happening as it happens, which means readers do, too. Phil and Ren start out fairly typically. Ren is learning, Phil is teaching her. Then readers start to catch a whiff of ulterior motives, and then those motives slide into something much deeper, much like a domino effect. Once the ball starts rolling, it doesn’t stop. Perhaps one of the most fascinating aspect of the book is how quickly Brust and White turn the concept of “good guys” on its head. No one in this book is good, and no one is really bad. They might wrap themselves in one term or another, but it becomes fascinatingly obvious that everyone operates on a sliding scale of those delicious morally gray hues that I love so much. The truth is, without Ren’s new and rather uninformed viewpoint, readers probably wouldn’t be as aware of the deeper themes in this book, or the moral gray area, or how Brust and White almost turn what the Incrementalists do into some sort of passive, subtle joke by the end of the book. Aside from all of that, Brust and White are a powerhouse duo. The text flows smoothly. Their prose is often hauntingly beautiful and poetic, and filled with atmosphere. While this is a rather serious book that will make you work for it, the authors keep enough humor throughout to keep the serious, deeper notes from becoming too overwhelming. 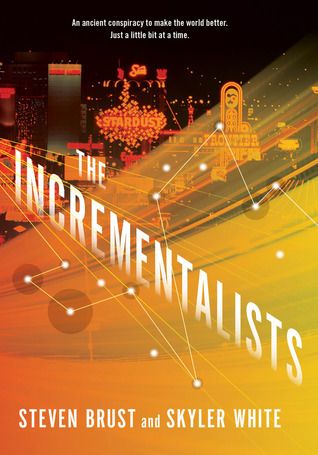 The Incrementalists is a gripping, keep-you-guessing, not-what-you-expect sort of read. It might be confusing. It is definitely deep and thought provoking. The first person perspectives might turn you off, but for those willing to put in a little effort, the payoff is extreme and wonderful. The Incrementalists takes a simple idea, like the domino effect, and blows it up. Readers will go on one hell of a ride in the process. >>I have tried to write this review no fewer than four times. Each time I get about three paragraphs into it, and hit the delete key. Not because this book is terrible, but because I honestly can’t figure out how to talk about it. The Incrementalists is so deliciously complex and layered that talking about it in any generic terms requires some mental gymnastics. I’ve had this issue myself in trying to review it. It’s one of those books that is hard to put a finger on. It’s slippery that way. This book feels like a lesser version of Octavia Butler’s Patternist series. I’ve never read that, but it looks like I should. Enh, its a very vaguely similar concept but I think Butler’s work goes in a significantly different direction than this. You will get more eventually, they are working on a second Incrementalists book! i’m happy you liked this one, it’s one of my top picks for this year. I’m on the other side of things, as I love first person perspective, and usually do pretty good with multiple first person perspectives. Helps too, that going into anything with Brust’s name on it I know I’m in for something complex and dialog heavy. I haven’t yet read anything else by White, so I’m not sure if that is her style as well. You’re right, these two are a sublime writing team. I don’t think I’ve ever ready anything else by Brust, but I’m really excited to try him out. The first person perspectives didn’t really bother me, but I added that point to the review because I could see how that sort of thing could bother people. I loved this book. It’s probably top of my list this year, too. It’s one of those books I need to read again just to understand it all. I love books like that. You haven’t read anything else by Brust? You poor deprived soul! Jump in your car right now and run over little old ladies if they get in your way. Get to the book store. Buy everything they have by Brust and lock yourself in your room for the next week or two. The local pizza shop makes deliveries if you have to eat. You can take the books to the bathroom and drink from the faucet while you’re there. Everything else can wait. Read Brust! I preordered this book on Amazon a few months back and it just arrived yesterday. I can’t wait to dig in. I seem to be one of the few who really didn’t like this book. I found that there was way too much unmarked dialogue, a romance that I couldn’t feel anything from in the slightest, and over half the characters needed some serious development. I can see why all of these things were done, from a stylistic standpoint, but they were a pain to read and I found myself bored and frustrated more often than not.